~Of all the high quality facets to these engines, there are some accessories that have me shaking my head. 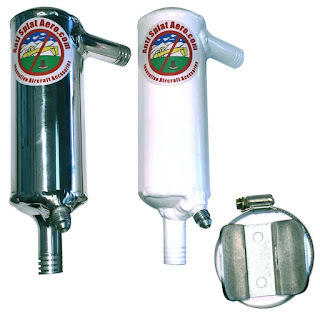 One of those is the air/oil separator that is included with every engine. The UL separator is a cheap plastic unit that has almost no ingenuity in its design and coincidentally doesn't do its job very well. The reason we have these separators in our aircraft is because our engines, being air cooled, create more blow-by than a typical automotive engine and can therefore "blow-out" significant amounts of oil. It all stems from having loose tolerances in the piston rings to compensate for a wide range of operating temperatures. Just this morning, one of my readers asked why, after only 300hrs would he be noticing blow-by, and the truth is that it's not all that uncommon. Just walk around the ramp and look at all the crankcase vents to find that Texas Tea dripping off. With that said, there is a great debate among aircraft owners and mechanics as to whether or not we should be using these separators at all. This debate boils down to the idea that "blow-by" oil is not the kind you want going back into the engine and can be very acidic. On the other hand, with only 50hrs between oil changes, the acids don't spend much time doing damage. This is all assuming the airplane flies often and doesn't go more than a few months between oil changes. Either way, I'm not here to debate that topic but only to point out the poor design and lack of quality in the UL separator as seen in the pictures below. The GOOD news is that there are plenty of good air/oil separators on the market to choose from. I personally have experimented with a few but have settled on a really nice unit made by Anti-Splat Aero. The unit incorporates a very complex chamber that is designed around a dyno and real life testing with high success. Best of all it is compact, lightweight and very affordable. ~DO NOT use the oil cooler offered by or sold by UL Power. Multiple oil cooler failures have been reported. 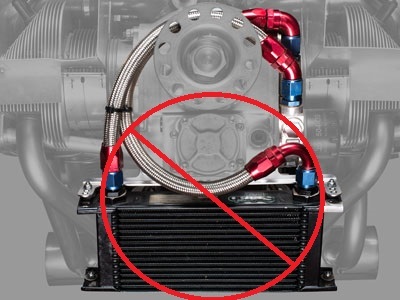 The coolers being shipped in the oil cooler kit are cheap automotive coolers that do NOT belong in an airplane. Buy a real airplane oil cooler from Aircraft Spruce or another trusted aircraft parts dealer only. Yes they are expensive, but making an emergency landing with a smoke filled cockpit isn't worth it. The spark plugs that come with every UL Power engine are the Bosch FR5DTC series. These plugs are great spark plugs, BUT are too cold in heat range for the fuel mapping UL Power chooses to use. The rich fuel mixture from UL Power will cause these spark plugs to foul up in less than 10 hrs of run time, making it a real headache to keep them clean. The solution I have found is to remove the stock park plugs after breaking in the engine, and replace them with the Bosch FR6DTC series plugs. These new plugs are 1 heat range hotter than stock and run much cleaner with no signs of pre-ignition or detonation at all. I highly recommend the new FR6DTC plugs for all UL Power engines.